This is a real Story!!! I curiously clicked on the mail to see what was written. "Hi Ronnie," she greeted me. Isha was still the same beautiful girl with those seraphic smile. She was smart and she seemed to have matured.The way she spoke and behaved was somewhat unusual and strange. "Hey Isha! after a long time girl," I replied. "Where is Aneesh?," I anxiously asked her. "Hmm! we broke up dude," she said with a sad face. "What?When it happened?" I was perplexed. "It happened the same daywhen you guys fought.You must be knowing that I took your side," She said with a straight face. "Yes,I do remember," I said. "He somewhat felt bad and spoke malicious words about both of us," she cried. "He linked both of us and this was why we broke up," She said. "Its 2 years now since I last met him," she added. "Oh! I'm really sorry," I said. "You don't need to be," she said. "May be he didn't deserve me," she winked. We spoke for hours and I'd my friend back.I wished to hold her tight and never let her go away from me.She was doing her Engineering from a famous Engineering College in Mumbai.We started hanging out together.We used to go for movies just like normal couples. We used to roam across Bandstand and Marine Drive.We would go everywhere.Later on she introduced me to her parents.Two years passed and we become best friends.It was only then I realized that it was the time for me to confess my love for her. "I think I am in love with you," my voice started trembling. We remained silent for a while. "Will you give me some time to think," she paused. After that we never met frequently. The last time I met her was at the Mumbai Airport.She was leaving for US to pursue her MS from the Univ of Illianois.Months passed and again I started missing her.I used to call her most of the time.Few weeks hence I tried calling her. But she refused to pick up the phone. I constantly tried dialling her number. "Hey Isha babe..," I greeted her. "I'm still waiting for your reply," I added. "Ronnie, I'm busy at the moment ,will call you later," she said and cut the phone. I failed to understand the reason why she was trying to ignore me.Later on when I logged onto my facebook ,I got the biggest shock of my life. 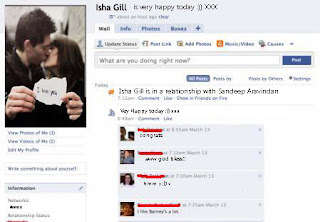 "Isha Gill is in a relationship with Sandeep Arvindan," her facebook status read. I could see photos of Isha kissing a guy.I was shattered and broken as soon as I saw those photos.I felt dejected and depressed. 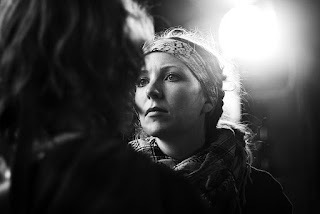 I soon realized that she had ruined my life.I didn't want to see her again in my life and at the same time my phone rang. "Isha sweetheart calling..."My cellphone rang. I switched off my phone and left the place. I took french leave from my office and left for Amritsar.I left Mumbai once and forever. This was so wrong... she should have told him. But I think, some graze jsut like that till they find greener pastures... Sad! that sure is a sad ending but its not the end of the world. later in life, something will make him realise why things didnt work out with her ..
just wasnt meant to be! Arey, this was not a sad ending for that guy! He must be happy from now on atleast! He knew what is life and learnt a biggg lesson from a relationship!! Just Move on man..
P.S: I read both of them and commenting in second part! Neat write up! Is it by any chance your story? thats a heart breaking story!! i liked it! ermmm...shouldn't you be happy that she's gone? like she wasnt the brightest crayon in the box you know!!!! Hmmm..this is sad....!! bt justifies ur title ...!! !